Hobbit drinking songs for Lord of the Rings fans. 18. Do You Fancy a Drink? There you are at the Sign of the Prancing Pony in Bree, when you hear the sounds of rollicking song inside. You push open the heavy oak door to see small hobbits dancing on the bar, spilling beer and singing at the top of their lungs. Little did you know that there are scores of great hobbit drinking songs. Marc Gunn, The Celtfather, met up with Daisy Brambleburr of Bindbale Wood (aka Rie Sheridan Rose) in Hobbiton to discuss and share the drinking songs of the hobbits. He came back with a plethora of great hobbit songs and tunes to share in his newest album, Don’t Go Drinking With Hobbits. Three years ago, the Brobdingnagian Bards were invited to perform at the first A Long Expected Party where they celebrated a reenactment of Bilbo Baggins’ birthday party. It was an amazing event, a weekend of high adventure, stories, songs, legends, languages, art, and more. Now, the same folks who brought us that bring us There & Back Again for another weekend of Tolkien bliss. Once again, Marc Gunn will be there to perform. It was the first party that inspired the idea this album of hobbit drinking songs. Gunn loves Lord of the Rings. It is one of the reasons the Brobdingnagian Bards recorded Memories of Middle Earth. While Memories of Middle Earth featured music inspired by Lord of the Rings, this album also shares Marc Gunn’s love of drinking songs and fun songs with which you can sing-along. With this album, Gunn asked the question, what kind of songs might the hobbits sing in a pub in The Shire? Together with many lyrics by Rie Sheridan Rose, Gunn composed music from the hobbit’s perspective. Most of the songs you might hear in a pub. It’s music for people… with character, heart, and passion. It’s music for the olde times and new. It’s music for me and you. It’s music for hobbits and those who love them. Marc Gunn plays acoustic folk music rooted in the American Celtic song tradition–-Celtic music, the Traditional and the Twisted. He brings a powerful and expressive voice to Celtic music. His musical instrument of choice-the autoharp-continues to surprise musical veterans and fans a like for it’s unique sound and spirited energy. Donned “The Celtfather” by Celtic music fans, Gunn is a champion of indie Celtic music. He has given away over ten million MP3s through his music and podcasts since he began his Celtic music career in 1999. His award-winning Irish & Celtic Music Podcast earns over 30,000 downloads of each show and is one of the most-popular music podcasts on iTunes. Embrace independent Celtic music! Don't Go Drinking with Hobbits is a wonderful cd for Tolkien lovers as well those who love celtic music. The title song makes you want to sing along (after one listen, my husband was whistling away!) However, "The Ring of Hope" is a sweet ballad- almost brought tears. Needless to say, I felt like getting a tankard of ale out to toast this whole album. Enjoy it!! Another Masterpiece from Marc Gunn! I have several C.D. 's of Marc's and this one is another on my list of favorites. I've always liked the " Lord of the Ring's " with my first being " Memories of Middle Earth ". To me this C.D. is on a more personal level and it let's you know the hobbit's better. So if your looking for something to perk you up or thinking of a neat gift for a friend or loved one then I suggest this C.D. 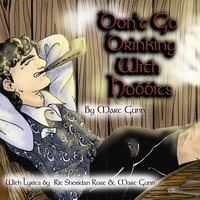 Marc Gunn's new CD; "Don't Go Drinking With Hobbits" reveals his fine Celtic sensibilities. Fans of "The Lord of the Rings" and Celtic music alike will enjoy this production. One of my favorites on the CD is the instrumental, "The Hobbit Journey Home." I recommend you pick up your copy today. I think Marc is hitting a grove. He has really matured as a singer/songrite/producer. This has a very nice mix of musically instruments and voice talent. As always, Marc has placed several good song on one album as oppose to one good one plus several mediocre. I will just have to give one word of warning. Don't listen to 'A Well Dressed Hobbit' while driving in stop-n-go traffic. It is very infectious and you may notice yourself speeding up. Thanks Marc for another great album. This CD is absolutely delightful! The music is fun and rollicking and lightly serious by turns and not only enjoyable as itself but deeply Hobbity in character and mood. Well done!! I was playing mine in the car, this morning, and got all misty over "Ring of Hope"! Heard Marc sing it many times before, too! Love this CD even though I don't drink! If you've already gone through all the LotR music you own multiple times and want more (like me!) this is a great album. Even if you're never heard of Marc Gunn or an autoharp, these songs and lyrics are very hobbity in feel and written with geeky love. It makes me feel like I am in the Shire. I love listening to "A-working in the Garden" while I do yard work. My other favorites are "Don't Go Drinking With Hobbits" and "Everybody Needs a Drinking Song". A wonderful tribute to Tolkien s creation. Marc and his autoharp blends Celtic music into the expansive world of Middle Earth. From the fun of the title track to the richness of The Ring of Hope, Marc delivers us into our own journey to the Shire and beyond.